Cerulean Warblers are small birds, just 12cm long. The males are sky-blue above, with two white wing-bars and underparts that are largely white except for a blue breast band. The females follow a similar patterning, but with greenish-blue colouring above and no breast band. Plumage does not change seasonally. The call is a high-pitched accelerating buzz. The Cerulean Warbler is a bird of the high canopy. Its breeding habits are better known than its overwintering period in South America, though it is known to form large mixed flocks there with other insectivorous birds. Breeding takes place in the North American late spring and summer, with four eggs incubated by the female and both parents feeding the chicks. Cerulean Warblers are thought to be monogamous, and the males aggressively defend territories in the high canopy by both singing and physically attacking rivals. 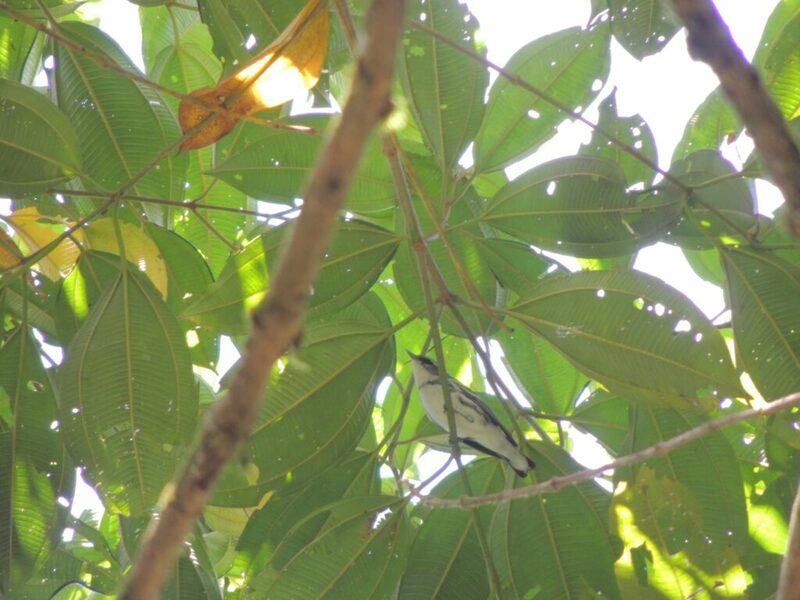 They usually forage insects directly from twigs in the canopy, though will sometimes catch them in flight. 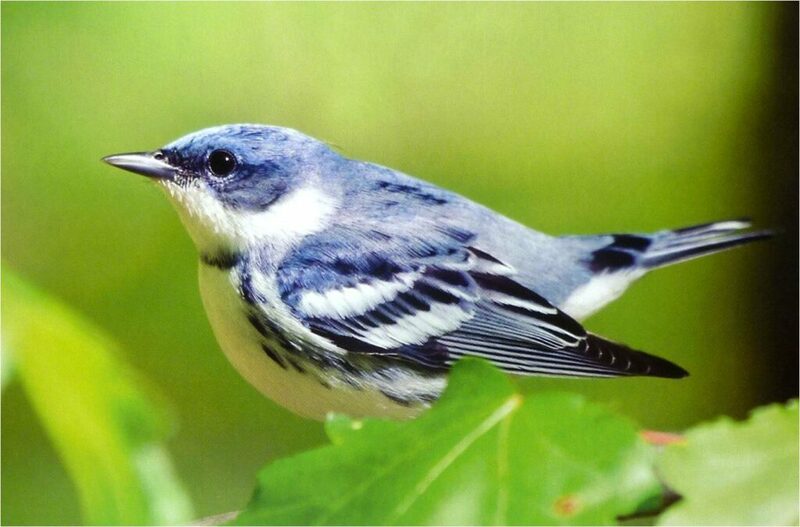 The Cerulean Warbler migrates over large distances, breeding in North America, with a preference for old-growth floodplain forest. 80 per cent of breeding populations are found in the Appalachian Mountains, but some birds breed as far north as Canada. Migration routes run along the eastern coasts of North and Central America, to wintering grounds that form an arc from Venezuela round to Bolivia. These are largely on the eastern slopes of the Andes, in sub-montane forest and usually at elevations of between 1000 and 2000 metres. While it was thought that these wintering grounds were restricted to primary forests, more recent studies also show intensive use of shade-grown coffee plantations. As with all migratory species, pressures on habitat at any point in the species range can have a negative impact on populations. Since 2004, the IUCN has listed the Cerulean Warbler as Vulnerable. Population estimates from 2016 still judge that there are 380,000 mature individuals, but there has been a sustained decline in numbers, approaching eighty percent over the past 44 years. Forest fragmentation and conversion to agriculture are the main threats to this species throughout its range. Problems specific to South America include conversion of shade-grown coffee plantations to more intensive use; in the breeding grounds, it has been shown that fragmented forest holds far lower densities of birds. Large-scale forest re-establishment schemes of over 1 million acres have recently taken place in the USA and should have strong positive effects for this species. However, corresponding protection of primary forest in wintering areas is equally necessary. Buehler, D. A., P. B. Hamel, and T. Boves (2013). Cerulean Warbler (Setophaga cerulea), version 2.0. In The Birds of North America (A. F. Poole, Editor). Cornell Lab of Ornithology, Ithaca, NY, USA.